Death in the Rainy Season is a compelling mystery that unravels an exquisitely wrought human tragedy. 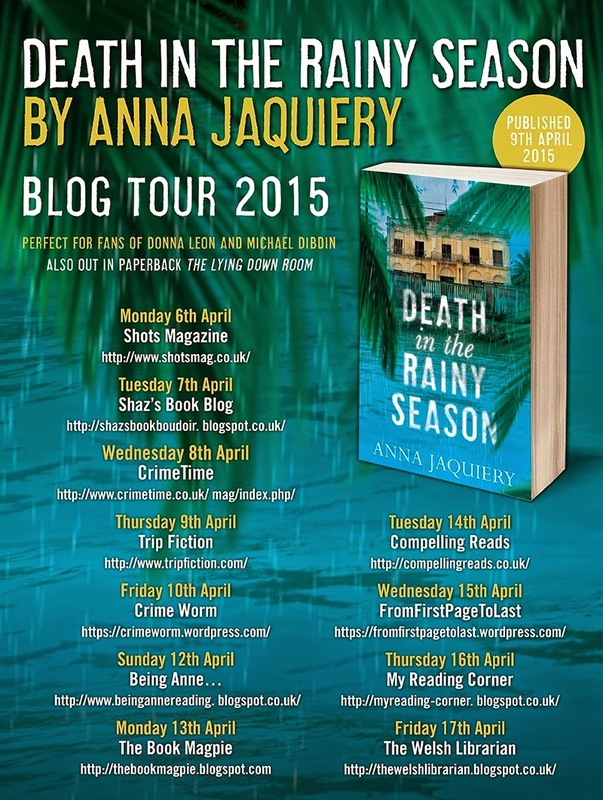 I am delighted to Welcome Anna Jaquiery to my blog today to talk about the writing process. I am always fascinated to know how others write, so this is a superb piece for me to be hosting as part of the 'Death in the Rainy Season' blog tour. The writing process. I always find it interesting as a writer to read about the writing habits of others. Recently, I read something in which the British historian William Dalrymple described a typical day working on his novel. It sounded blissfully structured. I envied him the order and serenity of his writing life, though I am sure in reality, life gets in the way of his writing too. When you publish a novel, people tend to ask about the writing process. Mine tends to be more or less the same each time. Before I start writing a novel, I do my research. With my first novel The Lying-Down Room, I researched baptism, and the influence of foreign religions and sects in Russia following the fall of the Soviet Union. With my second book, Death in the Rainy Season, I read books and articles on Cambodia, spoke to people who know the country well, and took a trip there. It wasn’t my first visit, but this time I went solely for the purpose of research. My third crime novel is set in a suburb north of Paris and deals with immigration. I’ve been immersing myself in everything from French crime novels and music to documentaries and films on Paris’s outer suburbs. As far as plot goes, I tend to start with a premise, and a vague outline, nothing more. I don’t plan ahead very much, which, for me, tends to make the writing more interesting. I don’t want to know everything that happens before I’ve started writing a book. Where would the fun be in that? But I have a clear picture of the setting and of the characters, right from the start. The writing process is all about discipline and endurance. Once I start writing, I write every day, diligently. For me, it’s important not to step away from the story for too long. I want to stay ‘in’ it as much as I can. I make time each day, even if it means sitting up late with coffee when everyone’s asleep. There are days when I feel like I’m just adding words and sentences to a story, almost mechanically, and I know I’ll have to go back and bring those sections to life. There are other days where I feel completely immersed in the story and the writing flows. Because I don’t plan much, there are discoveries along the way. I like that part of the process too. The best moment, though, is when I’ve finished the book. There is still the editing process, which is hugely important - but there is nothing better than that feeling you get, when you’ve reached the end. I'm the last spot on the blog tour, but be sure to check out the rest! Death in the Rainy Season is available to buy now from Mantle and all good book shops. Thank you to Anna and Sam Eades for allowing me to participate in the blog tour.